This 3 level estate is situated on over an acre, with exclusive use of 1.5 acres in the prestigious gated community, Glen Abbey. 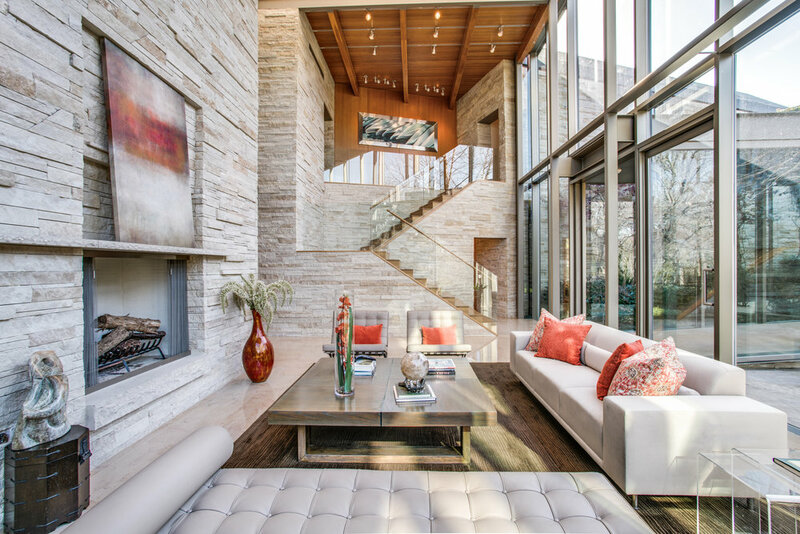 The grounds boast five unique waterfalls, five outdoor entertaining areas and the most exceptional views in the complex of White Rock Creek. Walk down and put your kayak in the water. There are six fireplaces, a custom spiral staircase commissioned by a ship-maker, leads to a third story deck with views of the 10 acre nature preserve on the other side of the creek, then goes three floors down to a temperature controlled wine cellar that holds 2,000 bottles. No expense was spared where nature was the primary element of design by famed architect Graham Greene. The negative edge pool has the most dramatic of the water features as two sides have a spill-over feature with three levels of flow. Must see to believe this masterpiece that took two years to design and four years to build.